Which Drugs Are Most Often Abused by This Group? What Are the Effects of Drug Abuse on Native Americans? What Are the Causes of Addiction in This Population? How Can You Tell if Someone Has a Problem? 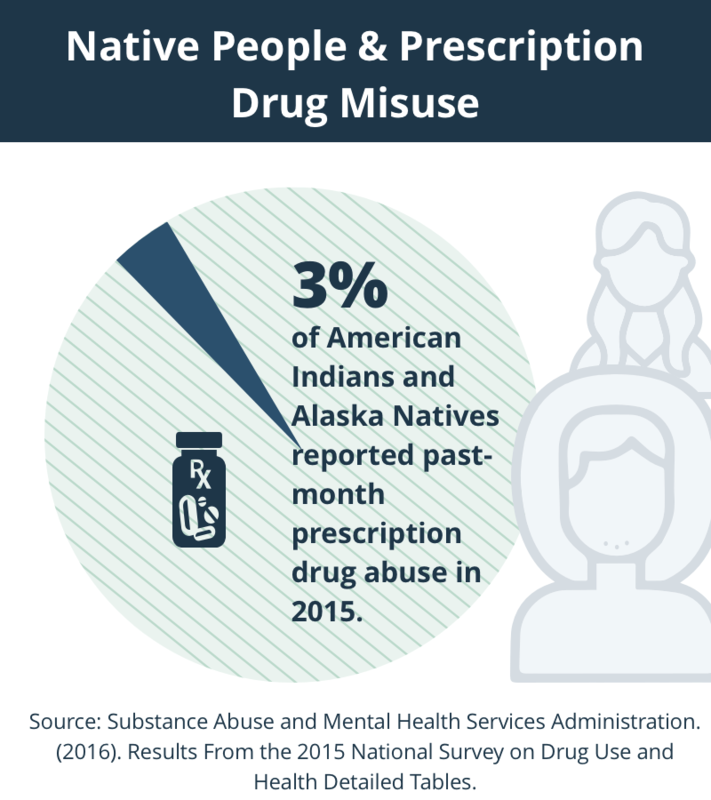 What Are the Barriers to Treatment for Native Americans and Alaska Natives? What Kinds of Rehab Programs Are Available? How Are Traditional Healing Practices Being Incorporated into Treatment? 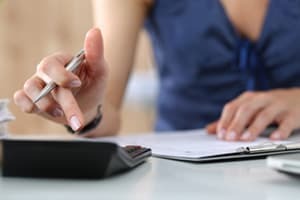 What Are Some Ways to Pay for Treatment? American Indians and Alaska Natives (AI/AN) comprise only 1.7% of the population, but they are at increased risk of drug and alcohol abuse compared with other races.1 Although alcohol is the most frequently abused substance in this community, illicit drug use is also on the rise, especially among Native American youth.2 Substance abuse contributes to health, economic, and social disparities in this group. This population may have difficulty accessing addiction treatment – particularly if they live on reservations. But rehab options exist, and recovery programs are increasingly incorporating elements of Native American culture. State-funded addiction treatment programs – These addiction programs are funded by the government. They may provide a variety of mental health services to people that meet certain income and other restrictions. Programs operated by nonprofit organizations – These include substance abuse programs operated by the Salvation Army and Catholic Charities that typically offer a range of services and are often based on income. Private inpatient detox and addiction treatment centers – Many people that have addiction issues initially receive inpatient detoxification and medical management. They may receive inpatient substance abuse treatment until they are medically stable. Outpatient treatment – It may involve drug or alcohol counseling. Other services may be part of outpatient treatment, including job rehabilitation, case management, and medication management. Residential programs – These programs provide 24-hour care in a non-hospital setting. 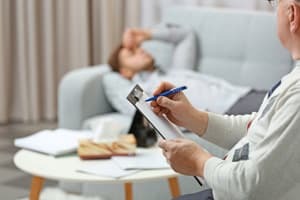 The care may involve a variety of treatments and therapies aimed at helping the individual conquer addiction, such as behavioral therapy, support services, holistic therapies, and medication management. Finding an addiction treatment program with culturally competent providers is ideal. Culturally competent health care providers have a basic understanding of and respect for culturally different patient groups. They can tailor addiction treatment in a way that accommodates and honors cultural values and beliefs. No single addiction treatment approach works best for everyone. Ask questions before making an appointment or checking in. Talk to your friends and family for recommendations. Talk to your community leaders. No single addiction treatment approach works best for everyone. Some people benefit from seeking treatment along with their peer groups. Native American teenagers might, for example, prefer to seek treatment with other teenagers rather than older indigenous people. Women may benefit from single-gender facilities that allow them to open up and share their cross-cultural experiences. Participating in traditional healing practices can be a powerful source of strength for some American Indians. It can help strengthen cultural identity, political empowerment, and community ties. However, the majority of American Indians do not live in traditional reservation settings. An estimated 60%-70% of American Indians live in urban or suburban areas.17 They often live in mixed-race communities and multi-ethnic families, with few ties to their cultural roots. If you have insurance through your job, your provider might cover some or all of your substance abuse treatment. Check to make sure the provider you want to see accepts your insurance. Many programs offer flexible payment plans or sliding scale fees, and scholarships might be available to some people. If you don’t have insurance or can’t afford to pay out of pocket, then you may need to seek other free and low-cost treatment options. You may consider seeking alternative funding sources, such as raising money from your community or starting an online crowdfunding campaign. Turn to your community leaders for advice on how to proceed. They may have valuable suggestions of where to find the best treatment. The resources listed below can connect you with treatment providers and help you find out if you are eligible for public health insurance. The Substance Abuse and Mental Health Services Administration (SAMHSA) This is a national organization that maintains a database of free and low-cost treatment providers. You can search online to find a treatment provider near you, or call their hotline at 1-800-663-HELP (4357). Indian Health Services The IHS provides a variety of resources to help prevent and treat substance abuse issues. They also offer a comprehensive behavioral health program that includes a variety of alcohol and substance abuse treatment programs. Public Health Insurance. American Indians and Alaskan Natives are eligible for many public health services offered through the Affordable Care Act. We R Native. This comprehensive program, operated by the Northwest Area Indian Health Board, is aimed at American Indian youth. It promotes positive growth and holistic health through a variety of programs. They also provide a variety of resources to help youth get help for substance abuse issues. A.A. for the Native North American. This pamphlet from Alcoholics Anonymous introduces the program to Native Americans and tells the stories of many Natives who have used AA for their recovery. Whitesell, N. R., Beals, J., Croy, C. B., Mitchell, C. M., and Novins, D. K. (2012). 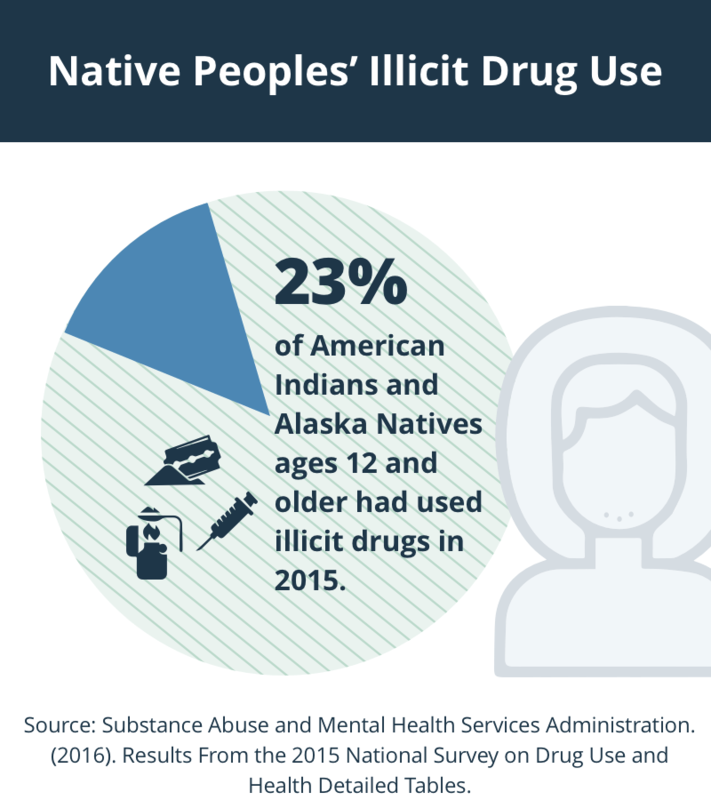 Epidemiology and etiology of substance use among American Indians and Alaska Natives: Risk, protection, and implications for prevention. The American journal of drug and alcohol abuse, 38(5), 376-382. National Institute on Drug Abuse. (2014). Substance use in American Indian youth is worse than we thought. Substance Abuse and Mental Health Services Administration. (2016). Results From the 2015 National Survey on Drug Use and Health Detailed Tables. Substance Abuse and Mental Health Services Administration. 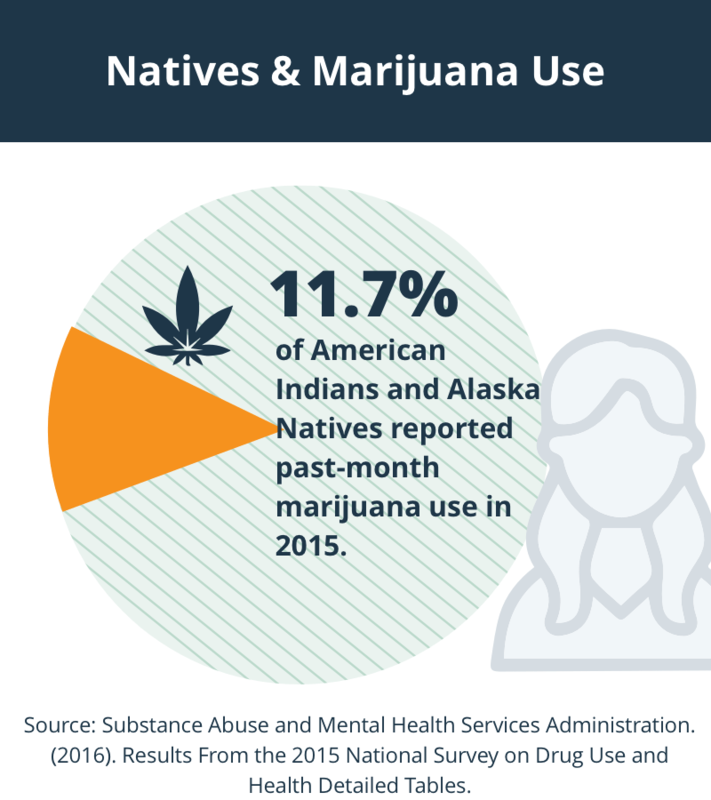 SAMHSA American Indian/Alaska Native Data. Forcehimes, A. and others. (2011). American Indian and methamphetamine and other drug use in the United States. Cultural Diversity & Ethnic Minority Psychology, 17(4): 366-376. Rieckmann, T., McCarty, D., Kovas, A., Spicer, P., Bray, J., Gilbert, S., Mercer, J. (2012). American Indians with substance use disorders: Treatment needs and comorbid conditions. American Journal of Drug & Alcohol Abuse, 38(5): 498-504. The Pew Charitable Trusts. (2016). Fighting Opiate Abuse in Indian Country. Sarche, M., & Spicer, P. (2008). Poverty and Health Disparities for American Indian and Alaska Native Children: Current Knowledge and Future Prospects. Annals of the New York Academy of Sciences, 1136, 126-136. Substance Abuse and Mental Health Services Administration.(2007). Fetal Alcohol Spectrum Disorders Among Native Americans. implications of cultural orientation for substance use among American Indians. American Indian and Alaska Native Mental Health Research 11(1), 46-66. Whitesell N.R., Beals J., Crow C.B., Mitchell C.M., Novins D.K. (2012). 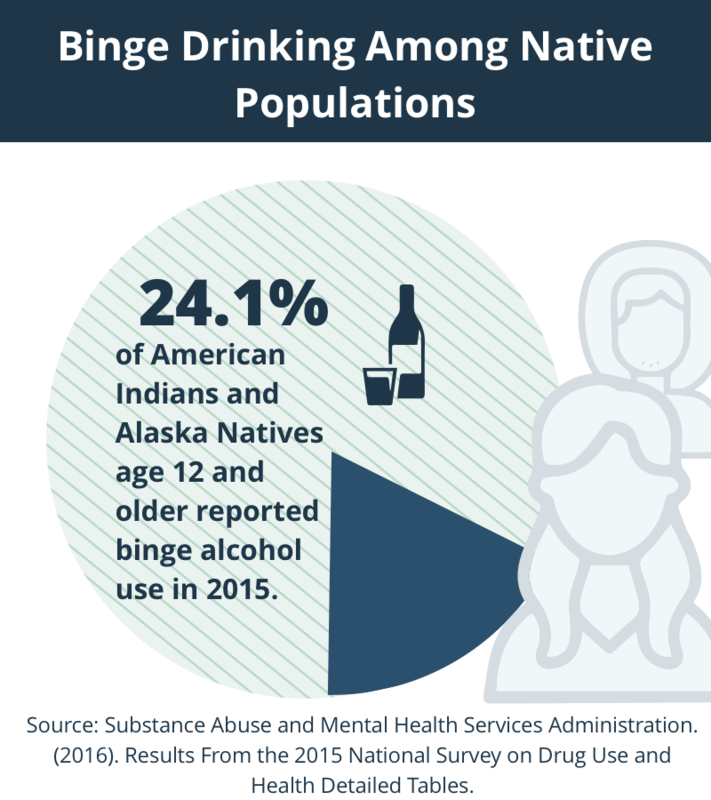 Epidemiology and Etiology of Substance Use among American Indians and Alaska Natives: Risk, Protection, and Implications for Prevention. The American Journal of Drug and Alcohol Abuse. 38(5):376-382. Yu M, Stiffman AR. (2007). Culture and Environment as Predictors of Alcohol Abuse/Dependence Symptoms In American Indian Youths. Addictive behaviors. 32(10):2253-2259. Legha, R., Raleigh-Cohn, A., Fickenscher, A., and Novins, D. (2014). Challenges to providing quality substance abuse treatment services for American Indian and Alaska native communities: perspectives of staff from 18 treatment centers. BMC Psychiatry, 14, 181. Novins, D. K. and others. (2011). Use of the evidence base in substance abuse treatment programs for American Indians and Alaska natives: Pursuing quality in the crucible of practice and policy. Implementation Science:IS, 6, 63. Hartmann, W. E., and Gone, J. P. (2012). Incorporating Traditional Healing Into an Urban American Indian Health Organization: A Case Study of Community Member Perspectives. Journal of Counseling Psychology, 59(4), 542-554. Indian Health Service. (2017). Alcohol and Substance Abuse Program.